April is likely to be drier than usual. Weak El Niño conditions have strengthened slightly during March and increases the chance for drier than usual conditions for April. Drier than usual April to June is likely due to weak El Niño conditions. Drier and hotter than usual conditions normally mean the potential for high levels of surface water evaporation is enhanced. Periods of excessive heat can increase heat stress for persons with heat-sensitive ailments, as well as for heat-exposed livestock, pets and other animals. 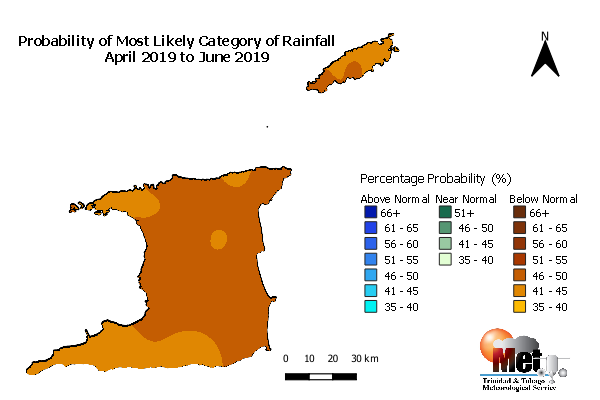 Figure 1: Category of rainfall likely for April to June 2019 (AMJ) with the highest chance of occurrence expressed as probabilities and colour coded on the map. Blues indicate that it is more likely for above normal rainfall to occur than for below normal or near normal. Browns indicate it is more likely for below normal rainfall, while greens indicate it is more likely for near normal rainfall. Normal is defined by the rainfall totals that were observed in middle one-third of AMJ rainfall totals during the historical period used to produce the outlook. There is a 60-70% chance for at least three 7-day dry spells during April to June. Figure 2: The map shows the chances for extremely dry conditions over the three months ending June 2019. Extreme refers to the lowest 10% of April to June accumulated rainfall in the historical record. 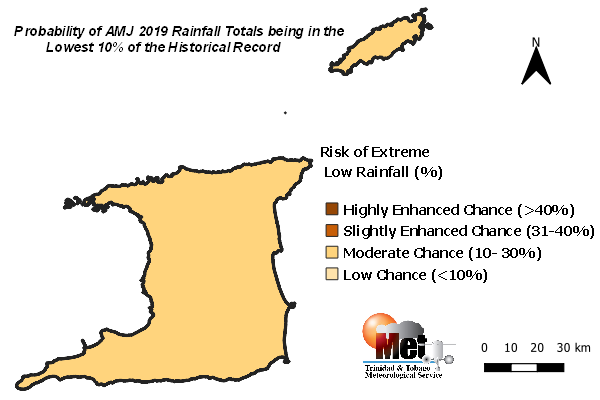 This means the chance for AMJ 2019 to be extremely dry is moderate (medium confidence). Figure 3: Possible accumulated rainfall totals with the highest chance of occurring during April to June 2019. Rainfall totals are likely to range between 220.0 mm and 485.0 mm in Trinidad with the lowest totals likely in south-western areas. Tobago totals are likely to range between 205.0 mm and 360.0 mm. Figure 4: Possible rainfall totals with the highest chance of occurring during April 2019. Possible rainfall totals range between 20.0 mm and 78.0 mm. Figure 5: Category of rainfall likely for July to September (JAS) 2019 with the highest chance of occurrence expressed as probabilities and colour coded on the map. Blues indicate that it is more likely for above normal rainfall to occur than for below normal or near normal. Browns indicate it is more likely for below normal rainfall, while greens indicate it is more likely for near normal rainfall. Normal is defined by the rainfall totals that were observed in middle one-third of JAS rainfall totals during the historical period used to produce the outlook. This means JAS 2019 is likely to be as wet as usual, while the chance for much wetter or much drier than average is less likely. There are increased chances for the occurrence of hot days (days with maximum temperatures reaching or exceeding 34.0oC in Trinidad and 32.0oC in Tobago) and short duration hot spells (periods of consecutive hot days). Drier than average conditions may favour some outdoor activities such as those in the Tourism industry. Sectorial Early Action That Can Be Taken To Reduce Possible Disaster Effects! Revisit contingency plans for efficient production and flood management for the upcoming wet season. Review your contingency plans and early warning information dissemination channels. Use drier conditions to conduct routine de-silting, cleaning and upgrading of drainage systems, water channels and river mouths in preparation for the rainy season. Revisit contingency plans to manage spikes in respiratory, heat-related and vector-borne ailments. Initiate contingency planning for drier than usual conditions. Be vigilant and visit the Met. Service website at www.metoffice.gov.tt regularly to keep up to date with local weather changes and follow us on social media. SSTs in the equatorial Pacific Ocean increased within the weak El Niño category during February and early March and further strengthened slightly from mid-March to present, while subsurface waters became more strongly warmer than average. Patterns in the atmosphere now show evidence of El Niño conditions present. Assessment of environmental conditions, collective model forecasts and guidance suggest weak El Niño are likely to continue through the rest of the local dry season and the start of the 2019 wet season. However, these are viewed with some caution since these model-based outlooks have less skill for forecast period. The closest historical years with similar in appearance to the evolving El Nino SST anomalies are 1987 and 2015. During these years, AMJ rainfall totals at both Piarco and Crown Point were below average. The North Atlantic Oscillation (NAO) continued in its positive phase during February and March and is expected to remain in its positive phase during most of April. A positive NAO tends to aid in cooling SSTs in waters around Trinidad and Tobago. This can negatively affect rainfall potential. The Madden Julian Oscillation (MJO), a key influencer of rainfall at the sub-seasonal scale enhanced rainfall over the southern Caribbean during mid-March. It is expected to be weak to none-existent in the region during April 2019, as models suggest that it will not be active near Trinidad and Tobago’s region during the next four to six weeks.